Innovative 3D printing for daily use from a picturesque fishing village in Portugal. Starting life in the small Portuguese municipality of Ílhavo, the 3D printing tech is headed by CEO Aurora Baptista who wants to challenge the status quo “as we know it”. As society becomes more leisure-oriented, with a deep preoccupation about sustainability, the company is well-equipped to tap into the global 3D printing market, estimated to be worth US$26.5 billion by 2021. BEEVERYCREATIVE has already started bringing affordable hi-tech 3D printing to the masses. The creator of the industry’s latest 3D printer for space stations has also won a prestigious 3D tech prize, the TCT Aerospace Application Award 2018. 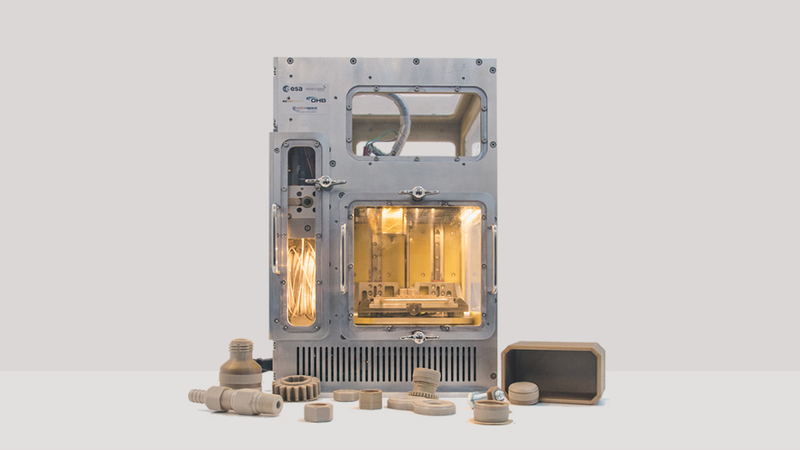 The specially commissioned 3D printer for the European Space Agency (ESA) was completed and delivered in May 2018. The Portuguese company was part of the consortium that won the tender to build a more robust 3D printer for the International Space Station. Besides the ground-breaking 3D printing machine for Outer Space, the startup is now applying for permission to transfer the technology to develop new industry-oriented 3D printers for product development and making prototypes. Manufacturers in industries like automotive, footwear and electronics can substantially cut the time and costs involved in rapid prototyping with high-end properties, materials and design flexibility. The 3D business is the brainchild of CIO Francisco Mendes and CTO Jorge Pinto. It was a “complete coincidence” because both were students at the University of Aveiro but didn't meet up until after an online discussion about 3D technology. Former Deloitte partner and management consultant Baptista was later brought in as a co-founding partner, and eventually became the CEO in 2015. The company mainly supplies products directly to consumers and is now part of the national initiative to transform Portugal's future economic development. Together with Siemens Portugal and local tech CadFlow, BEEVERYCREATIVE was selected by the Portuguese government to roll out “i-Experience Centers 4.0” across the country. It will equip the centers with 3D printers and provide assistance to users who wish to test and print their 3D projects at the centers. The centers will accelerate the diffusion and adoption of the 4th Industrial Revolution to automate and facilitate data exchange in manufacturing technologies - to create “smart factories” through Cloud computing, IoT and 3D printing. The first center was opened at Siemens Portugal HQ, where experiments in the holistic integration of large industrial processes can be carried out. Another growth opportunity is in additive manufacturing, where different layers of materials can be used to build 3D objects. Revolutionary product design is key to the company’s success. “We made the first 3D printer focusing on design, aiming to be the first that solved problems that others couldn't,” says Baptista. “Previously, the printers consisted of some bars and beams with strands everywhere and were not at all pretty. They were more for a workshop,” she explains. Today, the brand is stocked in half of the Staples outlets in Portugal under a partnership with the leading copy and print retailer. The Staples chain also offers in-store 3D printing and modeling services directly to customers who bring their 3D files to the stores. All the printers come with the free open-sourced BEESOFT 3D printing software and are compatible with Linux, Mac and Windows. Weighing under 10 kg, the portable printers come with specially designed carry-cases for supplies. Sustainable materials are also used, including biodegradable polymers obtained from plant starch like corn. Designed for the education sector, BEEINSCHOOL is a simplified version of the award-winning BEETHEFIRST portable printer that was voted the Best Consumer Printer at the 3D PrintShow Global Awards in 2014. Another popular product is a DIY-kit that includes all parts and instructions for the assembly of an easy-to-use 3D printer. The model can print bigger objects of up to 18 liters, or multiple objects automatically, without human intervention. Its “emergency resume” function enables printing to continue from the exact point when the printing was interrupted, for example, due to power failures. With more funding secured, Baptista says, “It's my dream that everyone can use this technology and save the planet. It could help save humanity”. Armed with revolutionary technology from the Space station project, the 3D pioneer is revving up to take off and conquer new markets in Europe and beyond.